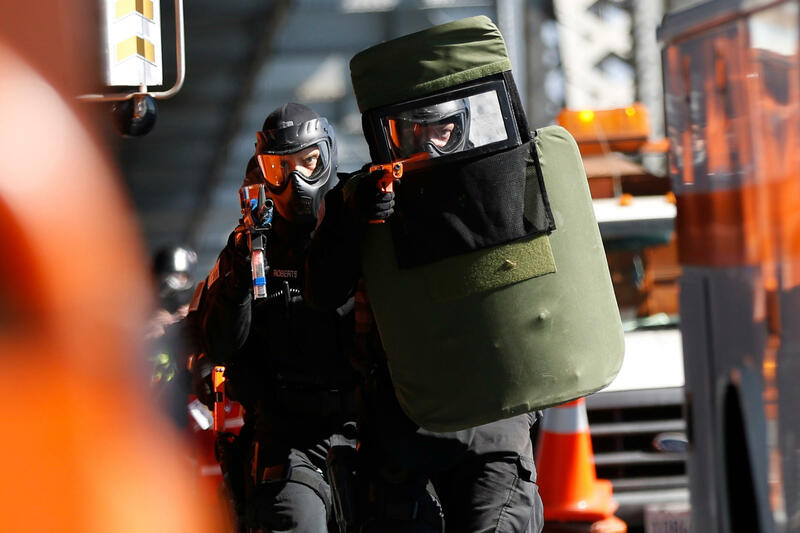 Members of the San Leandro Police Department SWAT Team during a planned training exercise in 2013. The FBI has been monitoring "swatting" — made-up crimes called in to 911 that are designed to get SWAT teams to deploy — for nearly 10 years. Now, police say revolutionary changes in the works for the system could make swatting an even bigger problem. Detective Richard Wistocki, an Internet crimes investigator in Naperville, Ill., says what often drives them is people playing video games trying to get revenge on rivals. "Usually when this happens they will hack into somebody's phone system or they'll do something through a TTY relay, which is for the deaf," he explains. They make it look like the emergency phone call is coming from the victim's home, which is what many believe happened in Wichita when a man made a hoax call to 911. That call led to an innocent man being shot and killed by police. Now some big changes for 911 are in the works, new technology that's raised concerns about what it means for swatting. The current system — devised 50 years ago — hasn't seen much change over the years and is limited. People typically verbally describe emergencies on the phone. The new system, called Next Generation or NG 911, is based on the Internet instead of telephone technology. The change will allow people to send information to emergency call centers as if they are posting to social media. "It gives us the ability to access 911 using the same voice, video, text and data applications that we're all used to using on smartphones today," says Trey Fogerty of NENA. This is a big deal because a picture of an accident scene might definitely help emergency crews responding to that crisis. A text to the new 911 might also be useful during a home invasion or domestic violence situations. But, the changes could also go awry. "You could conceivably have a video that is fabricated and is sent into a 911 dispatch center that appears to be one thing when in fact it is something quite different," says Chuck Wexler, the head of the Police Executive Research Forum. In Virginia, Fairfax County Police Chief Edwin Roessler says they've worked hard to train dispatchers and police to prevent getting duped by swatting calls and he's concerned the new system could bring more problems. "Unfortunately, there's evil people out there that continue to do this and the more we embrace that technology the more risk we have," he says. So spotting any red flags will be crucial. Police chiefs say dispatchers will have to become adept at quickly analyzing text and video. Designers are devising a way to mark suspicious video and text messages plus working to create a trustworthy alternative to today's caller ID, according to Fogerty. "That would make it much more difficult for callers to fake or spoof a call from a local jurisdiction or from a phone number that looks like it's from that jurisdiction," Fogerty says. The transition to NG 911 won't happen right away. It's expected to cost more than $10 billion to get everything running. Some areas have taken an interim step by allowing text messaging to call centers and, so far, 20 states have plans to adopt the new system. Police chiefs and emergency call center managers say there's still much to do to prevent any potential tragedies and missteps that could come with swatting and a new emergency calling system. A fatal police shooting in Kansas late last month focused new attention on something that's become known as swatting. It's an extreme prank when someone calls in and reports a made-up crime in progress in order to bring out SWAT teams or large groups of officers. And the caller doesn't give away their location. Now police say that revolutionary changes already in the works for the country's 911 calling system could make swatting an even bigger problem. NPR's Cheryl Corley explains. CHERYL CORLEY, BYLINE: There are more than 7,000 911 call centers in the United States like this one, the Consolidated Dispatch Center in Addison, Ill., just outside of Chicago. UNIDENTIFIED WOMAN #2: Nine-one-one - what's the address of your emergency? CORLEY: The National Emergency Number Association, or NENA, says 911 centers receive about 600,000 calls a day. No one keeps track of the number of swatting calls made across the country. For about a decade, though, the FBI's been monitoring the practice of those types of fake calls. Detective Richard Wistocki, an Internet crimes investigator in Naperville, Ill., says what often drives them is people playing video games, trying to get revenge on rivals. RICHARD WISTOCKI: Usually when this happens, they hack into somebody's phone system, or they'll do something through a TTY relay, which is for the deaf. CORLEY: Making it look like the emergency phone call is coming from the victim's home - that's what many believe happened in Wichita when a man made a hoax call to 911. That call led to an innocent man being shot and killed by police. Now some big changes for 911 are in the works - new technology that's raised concerns about what it means for swatting. The system devised 50 years ago hasn't seen much change over the years and is limited. People typically verbally describe emergencies on the phone. The new system called Next Generation, or NG, 911 is based on the Internet instead of telephone technology. What that means, says Trey Fogerty with the 911 association, is people will be able to send information to emergency call centers as if they are posting to social media. TREY FOGERTY: It gives us the ability to access 911 using the same voice, video, text and data applications that we're all used to using on our smartphones today. CORLEY: That's a big deal. A picture of an accident scene might definitely help emergency crews responding to that crisis. A text to the new 911 might also be useful during a home invasion or domestic violence situations. However, Chuck Wexler, the head of the Police Executive Research Forum, says the changes could also go awry. CHUCK WEXLER: You could conceivably have a video that is fabricated and is sent into a 911 dispatch center that appears to be one thing when in fact it is something quite different. CORLEY: In Fairfax County, Va., Police Chief Edwin Roessler says they've worked hard to train dispatchers and police to prevent getting duped by swatting calls. And he's concerned the new system could bring more problems. CHIEF EDWIN ROESSLER: Unfortunately there's evil people out there that continue to do this. And the more we embrace that technology, the more risk we have. CORLEY: So spotting any red flags will be crucial. Police chiefs say dispatchers will have to become adept at quickly analyzing text and video. Trey Fogerty with the 911 association says designers are devising a way to mark suspicious video and text messages plus working to create a trustworthy alternative to today's caller ID. FOGERTY: That would make it much more difficult for callers to fake or spoof a call from a local jurisdiction or from a phone number that looks like it's from that jurisdiction. CORLEY: The transition won't happen right away. It's expected to cost $10 to $12 billion to get everything running. Some areas have already taken an interim step, though, allowing text messaging to call centers. So far, 20 states have plans to adopt the Next Generation of 911. Police chiefs and emergency call center managers say there's still much to do to prevent any potential tragedies and missteps that could come with swatting and a new emergency calling system. Cheryl Corley, NPR News, Chicago. Transcript provided by NPR, Copyright NPR.